Hooray! January has come to an end, and my relief cannot be overstated. That's 31 looong days of post-Christmas blues, post-Christmas bank balance and general dreariness over with for another year! Having gathered together the products I've been loving most this month, I realise this is a pricey bunch of picks. I've been completely broke since New Year but, as I always have an overly large makeup stash to shop, my face hasn't had to experience the absence of money the way, say, my social life has. I may have done little more than go to work, but at least I was going to work looking bronzed and glowy, eh! For years, all I've used to remove my makeup is micellar water, but my skin is particularly dehydrated and flaky at the moment, so I decided to switch things up. I've been wanting to try this cleansing oil for a while, and it hasn't disappointed. It effortlessly melts away makeup, it's water-soluble so can easily be rinsed away, and it's gentle, unscented, non-comedogenic, non-clogging... All the things a cleansing oil needs to be to meet the many demands of my awkward skin. I use this to remove makeup before going in with a second cleanser, and it does the job perfectly. I'd recommend this for literally any skin type, including oily and blemish-prone types that wouldn't typically get along with an oil cleanser. My two most-used foundations of the last year (NARS Sheer Glow and the Jouer Matte Moisture Tint) are down to the dregs, so the time has come for me to get some use out of the rest of my base collection. Earlier this month, I did a bit of rifling, dug out my CT Magic Foundation, applied it to my face, and immediately wondered why on earth I'd been neglecting it for so long. I forgot just how flattering this is on my complexion! It's matte enough to play down my shininess, but also glosses over flaky patches that most foundations would cling to. It has a satisfying smoothing effect, and a good medium-buildable coverage that holds up exceptionally well on my oily skin - even on my nose, which has always been a real foundation-repeller. Half the joy of owning a product like the Filmstar Bronze & Glow is revelling in its luxuriousness. Just to hold it in your hands is a treat. This was a Christmas present, and after gleefully unwrapping it, I stared at it for a borderline-embarrassing amount of time. 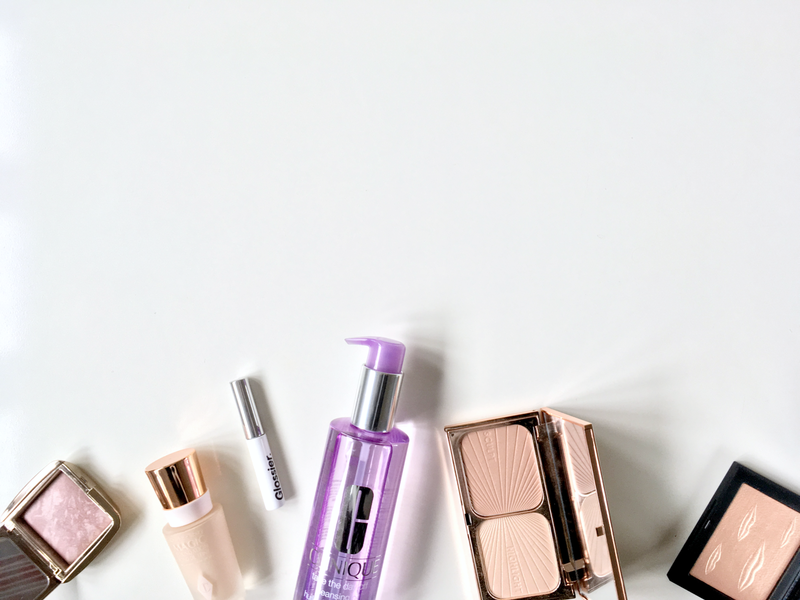 That rose-gold compact is the epitome of aesthetically-pleasing packaging! But, more importantly, both products inside are fantastic. The 'Sculpt' powder functions as a bronzer rather than a contour on my fair skin, and serves that purpose beautifully. Its undertone has a nice amount of warmth, and its texture is silky and oh-so-blendable. The 'Highlight' powder looks quite creamy and pale in the pan, but has a warm golden sheen once applied - of the smooth, non-chunky variety. The combined effect is the sort of expensive-looking sun-kissed luminescence you see on the red carpet. And yes, I feel pretty darn fancy whipping this out of my makeup bag. When I haven't been wearing the highlighter from the CT duo, I've been wearing 'Double Take'. It's a coppery gold shade which you can see looks too dark for me, but the formula is good enough for that not to matter. A light dusting on the cheeks easily diffuses into a softly-glowing peachy gold haze. Excuse my swatch below, which is doing nothing to showcase its sheen. Blended out, the colour actually reminds me of Becca's 'Champagne Pop'. If you like that one, you'll like 'Double Take'. I know this highlighter is limited edition and sold out almost everywhere, but it's still in stock at Space NK, so... I don't know why you aren't over there buying it right now. This is another product I take far too much pleasure in just looking at. 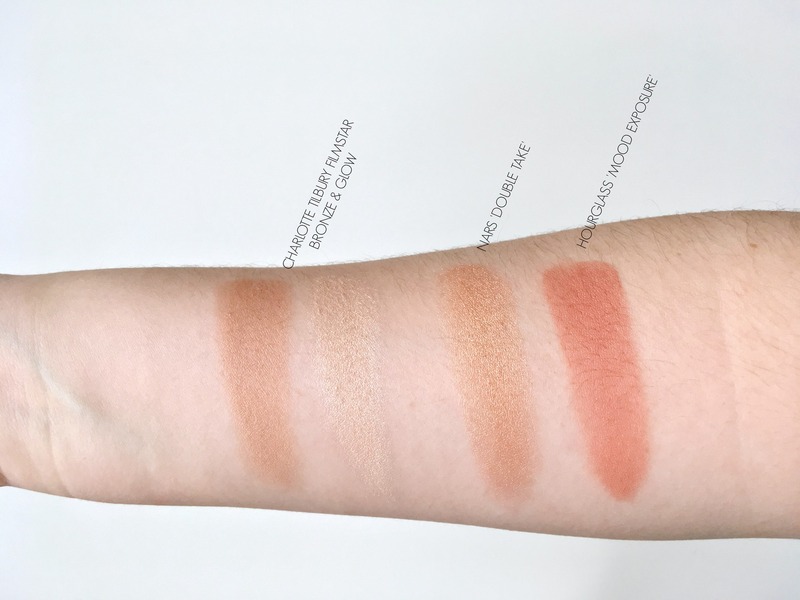 I will say that the pretty marbled effect doesn't exactly give you the most accurate impression of the blush colour, but it does do something to convey the sort of subdued, back-lit sheen the formula imparts. In the pan, 'Mood Exposure' looks like a mauve with a rather heavy purple-leaning, but on the skin, it's significantly warmer and rosier. I always find myself getting a lot of use out of this in the colder months - something about the way it looks on the cheeks says 'winter flush' to me. Plus, it makes the perfect partner to a plummy lipstick. I mentioned Boy Brow back in my November favourites, and it has consistently been a favourite ever since, but especially over the last few weeks when natural (read: lazy) brows are all I've had time for. My reluctance to peel myself from my bed every dark, cold morning this month has made running late a regular thing, and when I have all of ten minutes to get ready, pencilling my brows into matching shapes is pretty low on my list of priorities. On these occasions, it's no brow product at all or Boy Brow. That little colour and volume boost it gives is all I really need most days.